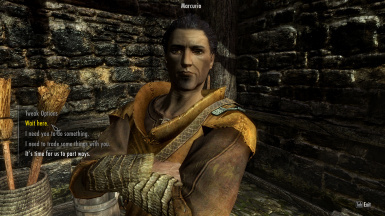 This mod is a replacement for the dialogue menu in Skyrim. It allows you to fully customize the appearance and layout of the menu, implements a much better navigation and control system and also fixes several bugs that are present in the vanilla dialogue menu. Say goodbye to the hard-to-read dialogue text and annoying controls. 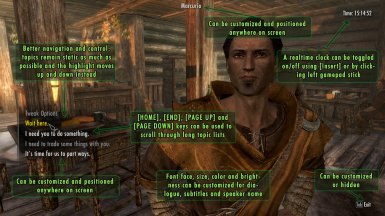 We'd like to give special credit to the SkyUI team, particularly MARDOXX, for the decompiled and corrected actionscripts. 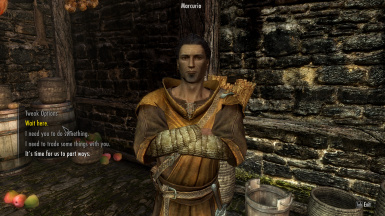 This mod is a replacement for the dialogue menu in Skyrim. It allows you to fully customize the appearance and layout of the menu, implements a much better navigation and control system and also fixes several bugs that are present in the vanilla dialogue menu. Say goodbye to the hard-to-read light gray on dark gray dialogue text and the annoying console-based keyboard and mouse control. There are 35 settings that can be customized using a simple cfg file. 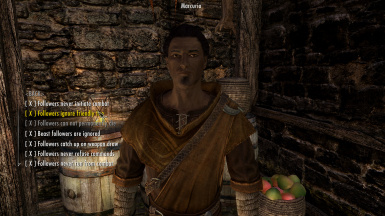 This file can be edited while Skyrim is running and the changes can be seen immediately in-game. The font used in the dialogue menu can be changed. There are 11 fonts to choose from. The size, color and brightness of highlighted and non-highlighted topics can be changed independently. The subtitle font color and brightness can be customized. The size, color and brightness of the speaker name can be customized. The position of the speaker name can be changed or it can be hidden completely. The position of the dialogue topic list can be changed. Text wrapping can also be modified. The "TAB to Exit" button text can be customized or hidden. A realtime clock can be displayed by pressing [Insert] or clicking left gamepad stick. Long dialogue topic lists can be navigated quickly using [HOME], [END], [PAGE UP] and [PAGE DOWN] keys. 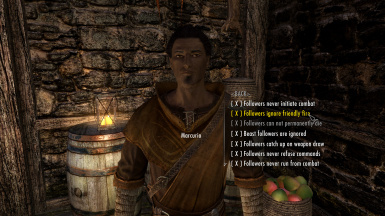 This is very convenient for follower mods like Amazing Follower Tweaks. Better, smoother scrolling through the topic list. 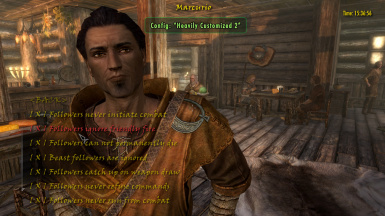 The vanilla interface was designed mainly for consoles and the topic list always scrolled up or down with the mouse wheel or keyboard slaved to the center of the list. With the new EZ2C navigation system, the topic list stays static whenever possible and only the text highlighter moves up or down. The list only scrolls when it needs to reveal more topics. The list scroll position is automatically adjusted to show as many topics as possible on the screen at once. No more confusion about what topic will be selected when you click the mouse or hit the E key. The highlighted topic will always be selected. The mouse, mouse wheel and keyboard work together more naturally. Also works with XBox 360 game controller. 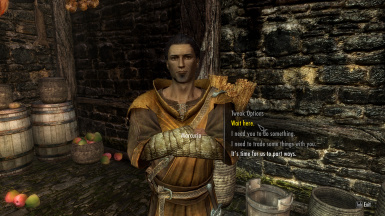 Dialogue topics would sometimes not appear if there were too many topics for the vanilla interface to handle - fixed. After scrolling all the way down with the mouse wheel, pressing UP with the keyboard would do nothing until the DOWN key was pressed, and the highlighted topic would jump to the top of the list - fixed. Hovering the mouse pointer over dialogue topics would limit the keyboard or mouse wheel control - fixed. Fixed a topic selection bug when using XBox 360 controller. Fixed a minor issue with missing drop shadow on speaker's name. Added an option to enhance drop shadows on speaker's name, subtitles and dialogue list. 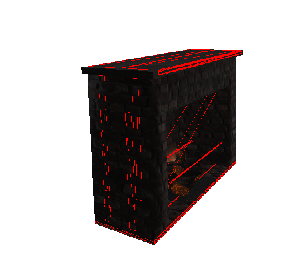 Added an optional realtime clock display. Better cooperation between mouse, mouse wheel and keyboard controls. Topics can be navigated using the [HOME], [END], [PAGE UP] and [PAGE DOWN] keys. Removed the annoying bounce effect when scrolling through topics using the keyboard. Keyboard, mouse or mouse wheel all select the same highlighted topic. The topic list will remain static whenever possible so that only the highlighted text scrolls up and down. The list will only scroll when it needs to reveal more topics. The decorative center marker from the vanilla menu is now obsolete and has been removed. The topic list can now be repositioned vertically as well as horizontally. The speaker's name can now he hidden. The cfg file has been reorganized and more helpful comments have been added. Tweaked the default font color and alpha values. The dialogue topics can now be positioned to the LEFT SIDE of the screen! In fact, you can move the dialogue anywhere across the screen to your liking. The width of the dialogue text area can be increased to stop the text from wrapping, so that more lines of dialogue will fit in the same area. The speaker's name can be positioned anywhere on the screen. The width of the "speaker name" text area can be increased so that the names won't wrap. The speaker's name can be rotated 90 degrees counterclockwise. 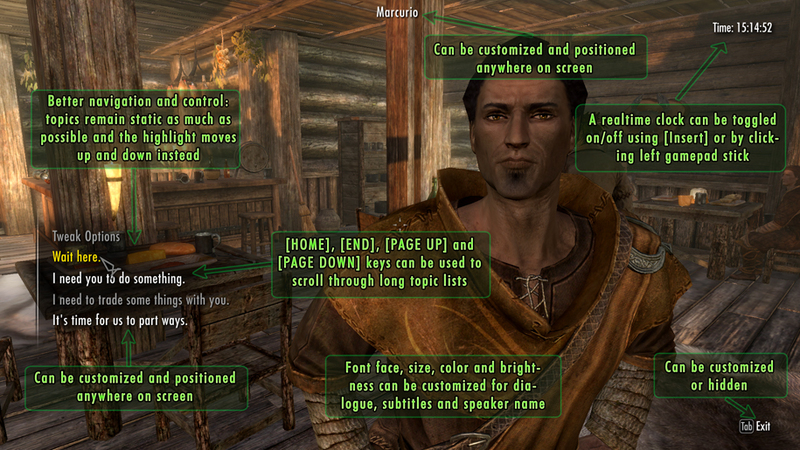 The dialogue interface is fully customizable using a single .cfg file. 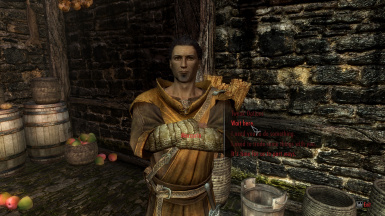 The .cfg file can be edited while Skyrim is running and changes can be seen immediately. The font face can be changed! There are 11 fonts to choose from. The font size, color and alpha (brightness/boldness) can be customized. New, old, highlighted and unselected dialogue topics can be customized independently. Subtitle text can be customized. Bullets can be added to dialogue topics. The "tab to exit" button can be hidden. Compatible with SkyUI and CFM. 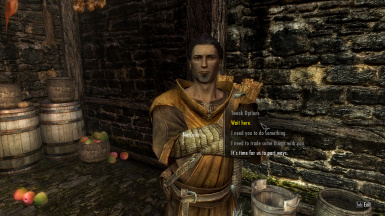 This mod is compatible with "Amazing Follower Tweaks" by Dheuster. The new navigation controls were designed with this mod in mind. Compatible with "Better MessageBox Controls." 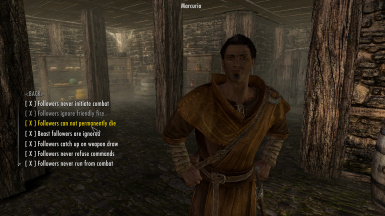 This mod is not compatible with the alternative dialogue mod "Better Dialogue Controls". 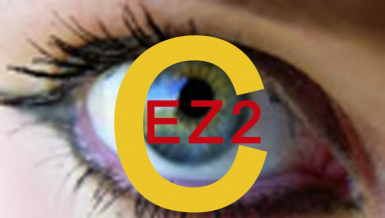 However, EZ2C implements its own system of navigation, control and visual improvements. If you were using EZ2C v2.1 or v2.0, please make a backup of your "dialoguemenu.cfg" file if you want to preserve your customizations. After updating, edit your new "dialoguemenu.cfg" to add back any customizations that you had in the old cfg file. Download and install using NMM. 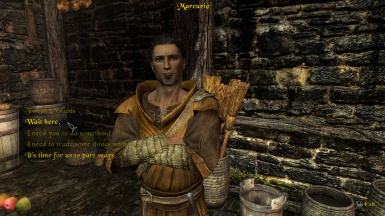 If you don’t use NMM, simply download the archive and extract “dialoguemenu.swf” and “dialoguemenu.cfg” to your Skyrim “DATA\INTERFACE” folder. The default color scheme is close to vanilla (with slightly enhanced brightness), but the selected dialogue topic is highlighted in gold. There are some sample .cfg files included in the archive. Simply copy the one that you want to use into your Skyrim “DATA\INTERFACE” folder, overwriting the existing “dialoguemenu.cfg” file. 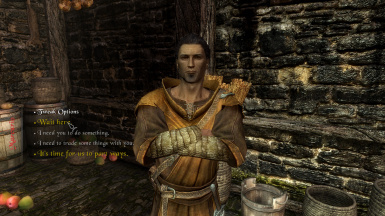 To uninstall, simply delete “dialoguemenu.swf” and “dialoguemenu.cfg” from your Skyrim “DATA\INTERFACE” folder. 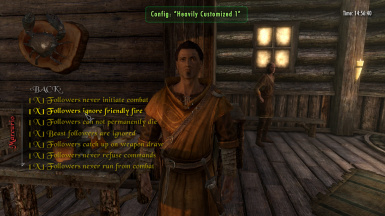 To customize the dialogue interface, simply edit the “dialoguemenu.cfg” file in the Skyrim “DATA\INTERFACE” folder, using Windows Notepad. You can edit this file while Skyrim is running (use ALT-TAB to switch to the desktop). After editing, save the changes and <ALT-TAB> back to the game. Make sure that you are not already in the dialogue interface (<TAB> out of it if necessary), then begin a new dialogue with someone - you will see the customizations immediately! Example configuration strings are given in the "dialoguemenu.cfg" file. See the comments with a hash (#) in front of them. The lines that you can edit are the ones that don't have a hash (#) in front of them. The text is case sensitive. Similarly, "topiclist_pos_y" can be used to adjust the vertical position of the dialogue topic list. Note that the coordinates are scaled such that x = -100 is the left edge of your screen and x = 100 is the right edge of your screen, while y = 100 is the top edge of your screen and y = -100 is the bottom edge of your screen. The exact center of the screen is x = 0, y = 0. Note that the ideal x coordinate might be different on your system depending on the size and resolution of your monitor, as well as the font face, font size and "topiclist_width" setting used in the "dialoguemenu.cfg" file. If your "speaker name" disappears after setting an extreme x or y value, try using smaller values, as you may have positioned the text outside of the screen area. To adjust text wrapping, change the parameter "topiclist_width". The vanilla value was about 300, but I've increased this to 600 in the configuration file. If the dialogue text gets truncated by the right edge of the screen, decrease the value until the text starts wrapping again, or move the dialogue text further left (as per the example above). You might have to adjust this parameter depending on the size of your font and the position of the dialogue text on screen. 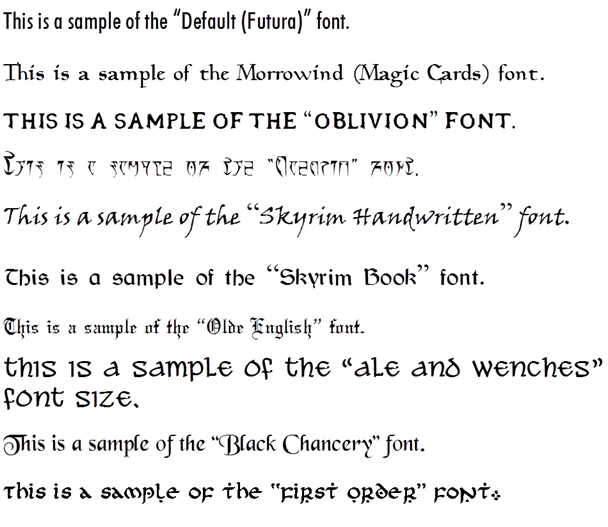 The non-vanilla fonts used by this mod are freeware or public domain obtained from dafont.com for personal or non-commercial use. Olde English: by Dieter Steffmann.